Hope everyone had a great turkey day. Now that the leftovers are pretty much gone, it’s once again time to talk food! For this month’s dinner column, we highlight Madison’s, which is the closest restaurant to us and, therefore, sees many of our guests heading in the door for dinner. We’re very lucky to be located near several great local restaurants, and Madison’s is included in that list. The common remark guests make when returning from Madison’s is, “We really enjoyed our dinner.” Much of the good experience has to do with the atmosphere. Madison’s has a cozy and casual yet eclectic and elegant feel to it. 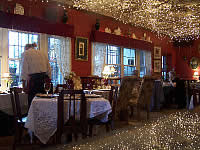 The ceiling is adorned with thin tree branches wrapped in tiny white lights, which adds to the restaurant’s quiet warmth. Madison’s attracts both vacationers and locals, people celebrating special occasions and folks finishing up a casual day of shopping. Madison’s has a little something for every one of its diverse guests…chicken, seafood, steak, pasta. Recent guests have raved about the pork chop, the pasta primavera and the portabello filet mignon. The restaurant also has a nice wine list and dessert menu. Madison’s is located just off I-40 (exit 66). They’re open every day for dinner except Wednesday. Reservations are accepted, and due to the restaurant’s popularity, it’s always best to call ahead to reserve a table, especially on weekends.